Lyft's $87 opening price is a "win for the system," even though it may have been a loss for investors that were overeager, CNBC's Jim Cramer said Friday. "I cannot stress this enough: we're at the start of an IPO season that looks on track to bring a trillion dollars' worth of companies public," the "Mad Money" host said. "These deals will be the big story going forward." In Lyft's debut on the Nasdaq, more than 6 million shares were traded at the open after more than 32 million stocks sold for $72 each in the initial offer. That's $15 less than the opening price tag. "I think the brokers would've preferred for Lyft to open at a lower level, but market orders from buyers with no discipline … ended up stretching the valuation at the open, even as the stock ultimately drifted lower, closing at $78," he said. But the syndicate desks released some of the buyers who had pledged to hold on to the stock to actually try to keep the stock down, so they could limit the losses for people who bought at the opening that was just unsustainable," he said. There's a case to own Lyft at $80, but $5 cheaper would be even better, Cramer said. China trade deal: Monday kicks off another week of speculation about a trade deal between the U.S. and China — the largest economies in the world. "If we make a deal with China, of course the stock market will soar," Cramer said. "If not? Given that today's rally was partially fueled by positive chatter from our negotiators, I think we'll go right back down without some sign of progress on some breakout in the China front." Retail data: If retail sales results top expectations, it will produce positive shock as much as the latest reports was negative, and strong data could eliminate the inverted yield curve, the host said. Walgreens: Cramer said Walgreens could miss expectations and guide down as CVS did. Drug stores are having a tough time competing with Amazon and other retailers, he added. The results will be released before the market opens on Tuesday. Dave & Buster's: Cramer said he likes that the restaurant and entertainment chain is expanding outside of the malls, but he is cautious about buying the stock here. The stock price may already reflect its strength, he said. The company reports its fiscal quarter ending January after trading ends Tuesday. 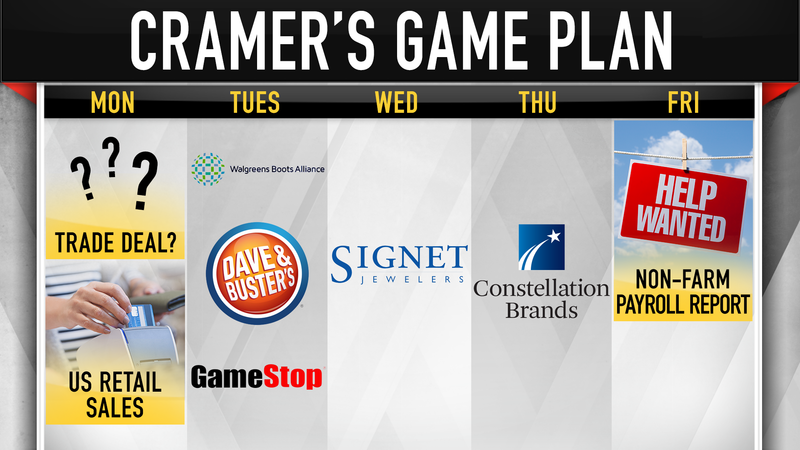 GameStop: Cramer said he is not "keen" on the dwindling franchise. Signet Jewelers: The diamond retailer will give its latest earnings before trading begins Wednesday. The stock has brought pain to shareholders, so don't touch it, Cramer said. Constellation Brands: Constellation Brands, which owns Modelo, Corona, and Pacifico beers, usually puts up strong numbers. But the last two earnings reports were not up to par, Cramer said. The stock sold off, but the host believes the company is preparing to compete in the cannabis space after making a $4 billion play for Canopy Growth and that makes it the best of its group, he said. March employment data: The non-farm payroll report will be "ridiculously important" because people are worried about a recession, Cramer said. Pointing out better weather ahead, lower mortgage rates, and employment numbers, he doesn't believe one's coming.